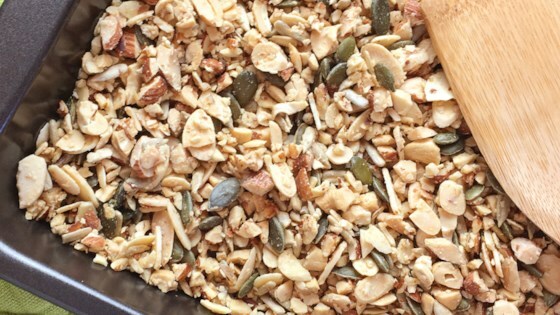 "A hearty grain-free granola that has no oats and is low on sugar, but loaded with crunchy nuts and seeds. A perfect way to start your day." Combine sliced almonds, chopped almonds, pecans, cashews, pepitas, sunflower seeds, maple syrup, and olive oil in a bowl; mix well. Spread out on a baking sheet. Bake in the preheated oven until granola looks loose and dry, about 1 hour 20 minutes. Stir every 20 minutes. Let cool completely before transferring to an airtight container.